The most popular operating system from Microsoft is Windows XP, it comes with host of powerful built in applications that are sometimes are not easily accessible. 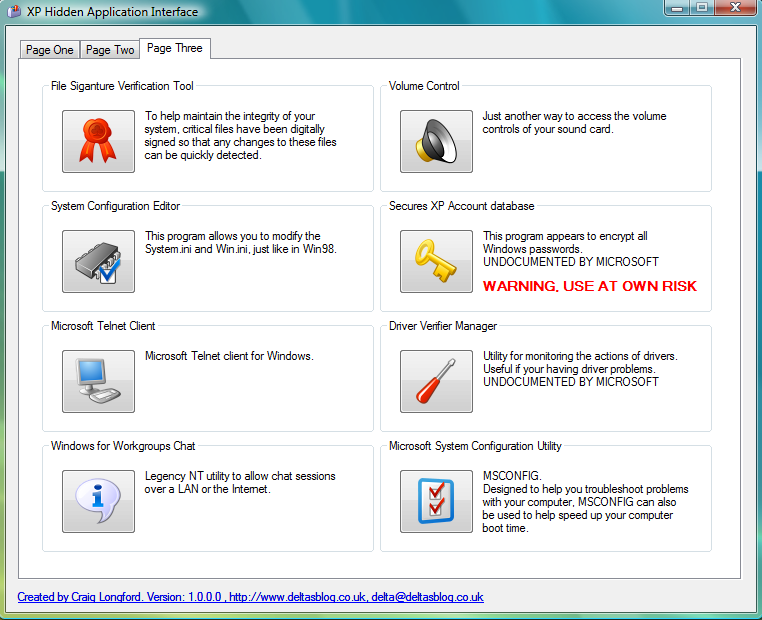 XP Hidden Application Interface (XPHAI) is a free utility using which you can gain access to Registry Modification, System Troubleshooting and configuration, Graphics Control, Messaging, Synchronization, Optimization, Communication Control, Encryption, File Management, Clipboard Viewer and etc. 1. Character Map: You can use Character Map to view the characters that are available in a selected font. 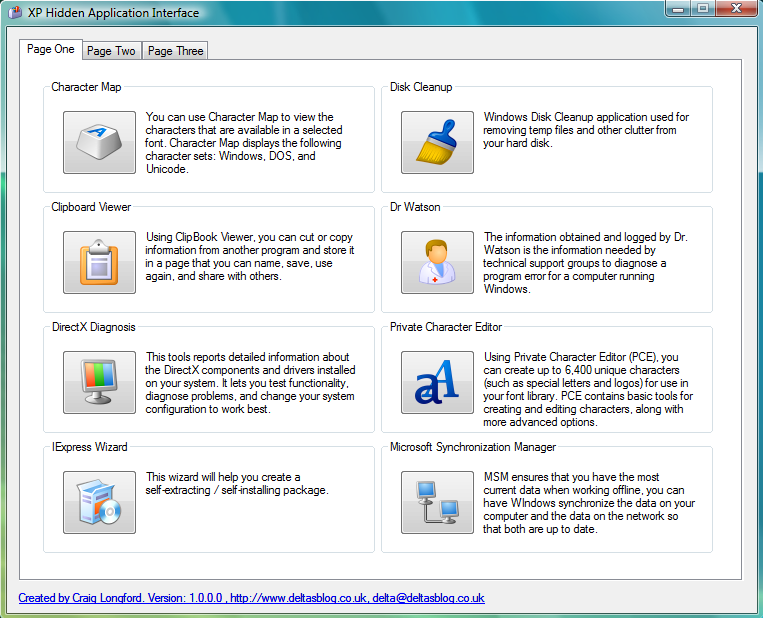 Character Map displays the following character sets: Windows, DOS, and Unicode. 2. Clipboard Viewer: Using ClipBook Viewer, you can cut or copy information from another program and store it in a page that you can name, save, use again, and share with others. 3. DirectX Diagnostics: This tools reports detailed information about the DirectX components and drivers installed on your system. It lets you test functionality, diagnose problems, and change your system configuration to work best. 4. Disk Cleanup: Windows Disk Cleanup application used for removing temp files and other clutter from your hard disk. 5. Dr.Watson: The information obtained and logged by Dr. Watson is the information needed by technical support groups to diagnose a program error for a computer running Windows. 6. Private Character Editor: Using Private Character Editor (PCE), you can create up to 6,400 unique characters (such as special letters and logos) for use in your font library. PCE contains basic tools for creating and editing characters, along with more advanced options. 7. Microsoft Synchronization Manager: MSM ensures that you have the most current data when working offline, you can have WIndows synchronize the data on your computer and the data on the network so that both are up to date. 8. Object Packager: Object Packager is a tool you can use to create a package that you can insert into a file. 9. 32bit Registry Editor: Registry Editor is an advanced tool for viewing and changing settings in your system registry which contains information about how your computer runs. 10. ODBC Data Source Administrator: Adds, deletes, or sets up data sources with user data source names (DSNs). These data sources are local to a computer and accessible only by the current user. 11. 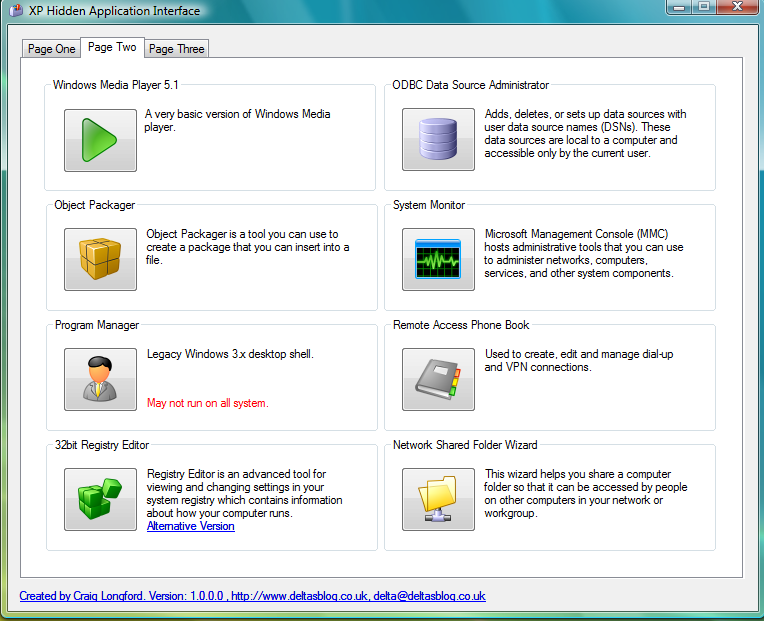 System Monitor: Microsoft Management Console (MMC) hosts administrative tools that you can use to administer networks, computers, services, and other system components. 12. Remote Access Phone Book: Used to create, edit and manage dial-up and VPN connections. 13. Network Shared Folder Wizard: This wizard helps you share a computer folder so that it can be accessed by people on other computers in your network or workgroup. 14. File Signature Verification Tool: To help maintain the integrity of your system, critical files have been digitally signed so that any changes to these files can be quickly detected. 15. System Configuration Editor: This program allows you to modify the System.ini and Win.ini, just like in Win98. 16. Microsoft Telnet Client: Microsoft Telnet client for Windows. 17. Windows for Workgroups Chat: Legacy NT utility to allow chat sessions over a LAN or the Internet. 18. Volume Control: Just another way to access the volume controls of your sound card. 19. Secures XP Account Database: This program appears to encrypt all Windows passwords. 20. 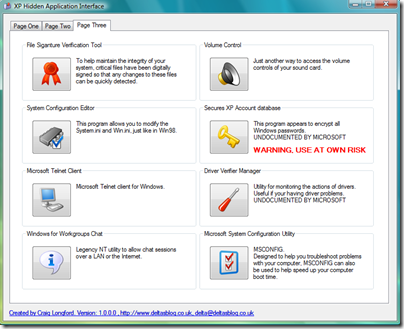 Driver Verifier Manager: Utility for monitoring the actions of drivers. Useful if your having driver problems. 21. Microsoft System Configuration Utility: This is nothing but MSCONFIG, designed to help you troubleshoot problems with your computer, MSCONFIG can also be used to help speed up your computer boot time. 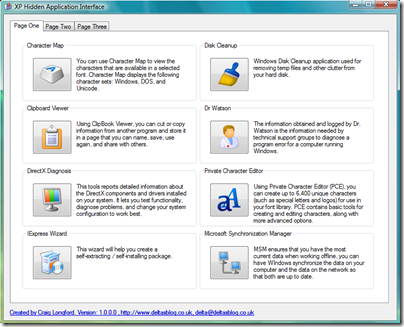 This utility allows you access a total of 24 powerful applications that are usually not easily accessible. To run this utility you would require Microsoft .NET Framework 2.0. 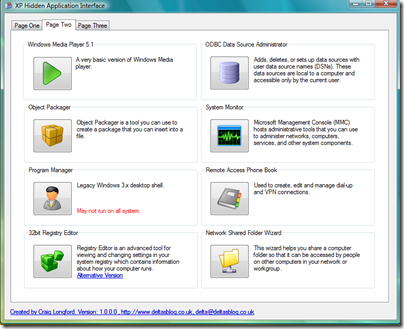 Note this application is intended to be used with Windows XP, but when we tried this Windows Vista we were able use certain applications that were common to both Windows XP and Windows Vista.